Conventional wisdom (and big media) would have us believe that using copyrighted material in today’s consumer generated media is just plain illegal – end of story. “Fair use” is the right to legally use copyrighted material under certain circumstances, and more broadly, according to the study, when the value to society is greater than the value to the copyright holder. The study authors Pat Aufderheide and Peter Jaszi categorize our collective CGM activities into: satire, parody, negative commentary, positive commentary, discussion-triggers, illustration, diaries, archiving and remixes and mashups. In essence, Auferheide and Jaszi illustrate, through the lens of online video making, that new “consumer maker” online activities are often “quoting” copyrighted material to create new pieces of popular culture, which falls under the “transformative” definitions of fair use. I’m not a lawyer, but I have to believe these same ‘transformative” and “cultural production” concepts might apply equally, if not almost more persuasively in MUVEs. Virtual worlds like Second Life are cultural production down to the very core and that norms there could push “fair use” into new interpretations. I’d be most interested if Benjamin Duranske over at VirtuallyBlind and other IP experts would weigh in on the study and comment on its application to virtual world CGM production. To protect the hands, attention, and minds that feed them, content creators need to examine ways to adapt to IP in a shifting media culture. 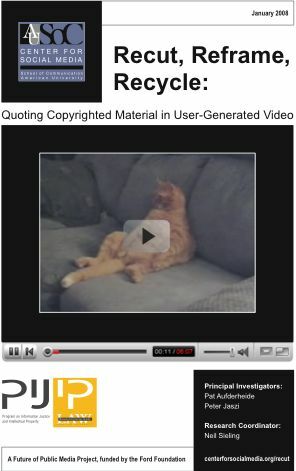 The Recut, Reframe Recycle PDF and web page include a list of the researchers’ top five videos. The Center for Social Media has posted a video, titled Remix Culture(3.5 minutes) that is itself a mashup of “unauthorized” material, hoping to stimulate conversation on their blog. The video is also downloadable.